Do you Read all those books? Quite often at book shows a curious looker will ask ” Have you read all these books?” and I usually answer truthfully but obtusely “I only wish” And that answer just is the tip of the iceberg, usually I find myself reading at least a few articles on Jstor about a book before I purchase it, and often I read a completer biography or a critique on the role of the author of the book I am considering on purchasing before I make the commitment. So I sort of wish I could only ‘just’ read the book in question and usually i read it on-line,(truly thanklessly,hard on the eyes) and this is before I purchase it… But that is also the Pleasure of my Job..
On other occasions after a fair amount of searching I find very little written which is pertinent on the book I am considering, in these cases I begin by searching the edges of scholarship or even just follow tangents.… That is the long answer… I tend to know more about the books than I ever write in my descriptions, some times in this blog I show more than has any commercial potential but ideas which are just interesting to me. This book is most likely THE First book in English to put forth a theory of EVOLUTION. The Primitive Origin of Mankind considered and examined according to the light of nature. Folio 12 1/2 X 7 3/4 inches a-4,b2,B-Z4, Aa-Zz4, Aaa-Bbb4,Ccc2. First edition. This copy is bound in full contemporary calf sympathetically rebacked with a spin e label. “The problem of human origins, of how and when the first humans appeared in the world, has been addressed in a variety of ways in western thought. In the 17th century the predominant explanation for the origin of the world and the beings that inhabit it, especially human beings, was based on the biblical account of creation. It was almost universally accepted that humans had been created by a supernatural agent using supernatural means. But alternative explanations for the production of the first humans did exist, according to which the first humans were produced by nature through some form of spontaneous generation” (Matthew R. Goodrum). In response to Isaac de la Peyrere‘s theory of polygenesis, Hale advanced his own theory that the earth was not eternal, but rather had a spontaneous “beginning,” and went on to defend “the Mosaic account of the single origin of all peoples” (Norman). He further believed “that in animals, especially insects, various natural calamities reduce the numbers to low levels intermittently, so maintaining the balance of nature” (Garrison & Morton). Hale anticipated Malthus in studying the growth of a population from a single family, and “seems to have been the first to use the expression ‘geometrical proportion” in respect to population (Hutchinson). Primitive Origination was written as the first part of a larger manuscript entitled Concerning Religion, the whole of which “was submitted to Bishop Wilkins, who showed it to Tillotson. Both advised condensation, for which Hale never found leisure” (DNB). This first part, called “Concerning the Secondary Origination of Mankind,” was published after his death as The Primitive Origination of Mankind. A lawyer by trade, Hale distinguished himself after the fire of London in 1666 by deciding many cases of owner and tennant dispute, and helped facilitate the rebuilding of the city. He also publically demonstrated his belief in witches when as a judge he condemned more than one suspected witch to death. Wing H-258 ;Norman 965 ;Garrison & Morton 215; Lowndes, 973. Goodrum, Matthew R. (April 2002). 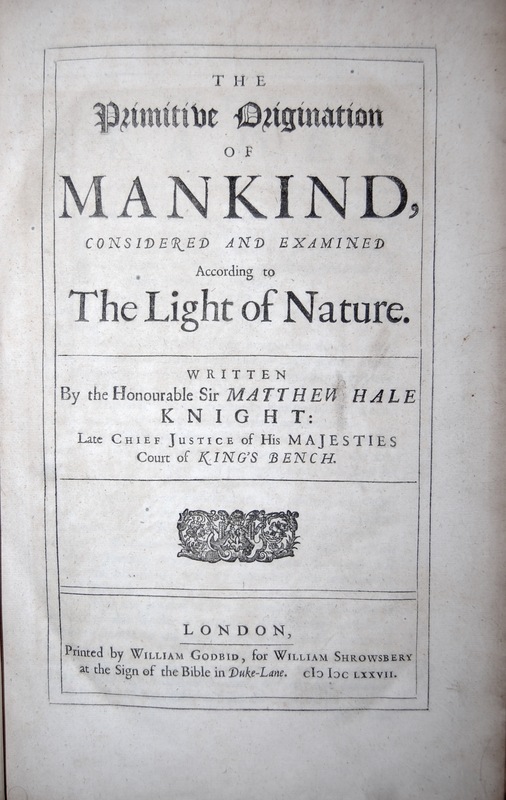 “Atomism, Atheism, and the Spontaneous Generation of Human Beings: The Debate over a Natural Origin of the First Humans in Seventeenth-Century Britain”. 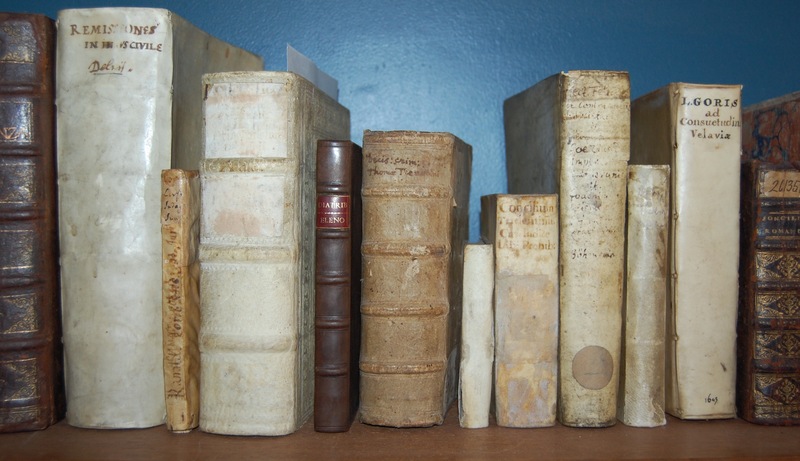 Journal of the History of Ideas 63 (2): 207–224. doi:10.1353/jhi.2002.0011. Bowler, Peter J. (2003). Evolution:The History of an Idea. University of California Press. ISBN 0-520-23693-9.